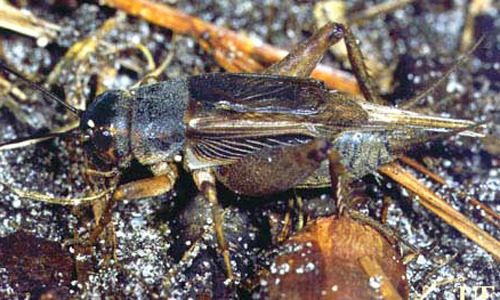 The Jamaican field cricket, Gryllus assimilis (Fabricius), was first described from Jamaica and is widespread in the West Indies. It may have first become established in south Florida as recently as the early 1950s. Its scientific name (Gryllus assimilis, or previously Acheta assimilis) was applied to all New World field crickets until 1957. In the United States, Jamaican field crickets are known only from south peninsular Florida and southernmost Texas. Figure 1. U.S. distribution, the Jamaican field cricket, Gryllus assimilis (Fabricius). Jamaican field crickets are not as dark as other Florida field crickets. The arms of the Y-shaped "ecdysial suture" are well defined, and most of the areas around the eyes are light yellow-brown. The pronotum has a dense brown pubescence that makes this field cricket appear "fuzzier" than the other Florida species. All adults have long hind wings. Figure 2. An adult male Jamaican field cricket, Gryllus assimilis (Fabricius). Photograph by Paul M. Choate, University of Florida. Jamaican field crickets probably occur in all stages at all times of year. Supporting this conjecture is the species' tropical origin and its rapid, synchronous development in laboratory colonies. Its relatively large size and ease of rearing might make it competitive with the house cricket as a species to be reared and sold for pet food. This species is characteristic of lawns, weedy fields, roadsides and other open areas. It sometimes flies to lights in significant numbers. An African field cricket in which all adults are long-winged was found flying at sea more than 500 miles from shore. Thus it is possible that the Jamaican field cricket reached Florida from the West Indies under its own power. The calling song (689 Kb wav file) of this species is a brief chirp repeated about once per second. Unlike Florida's other chirping field crickets, each chirp usually has seven or more pulses, with the initial ones being briefer and more rapidly delivered than the terminal ones (graphs). The pulse rate is so high and the pulse intervals so brief that the chirp sounds more like a continuous sound than in other chirping species. Alexander RD, Walker TJ. 1962. Two introduced field crickets new to eastern United States (Orthoptera: Gryllidae). Annals of the Entomological Society of America 55: 90-94. Walker TJ. (2011). Jamaican field cricket, Gryllus assimilis (Fabricius 1775). Singing Insects of North America. http://entnemdept.ifas.ufl.edu/walker/Buzz/487a.htm (1 August 2011). Publication Date: January 1999. Latest revision: May 2014.